Canine lymphoma is one of the most common cancers in dogs. While some breeds appear more at risk than others, all can be affected. While often treatable, canine lymphoma can rarely be cured. A continued understanding of the mechanisms causing lymphoma in dogs and identification of novel therapies are needed to improve survival in dogs with lymphoma. One area of research that has been actively explored and provided exciting breakthroughs for human lymphoma is epigenetics, or alterations in how genes are turned on and off independent of the DNA sequence. One way in which this occurs is due to modifications of the proteins that interact with DNA called histones. Various modifications to these histones can result in genes being turned on or off, leading to the development of cancer. One particular enzyme that modifies histones, EZH2, has been found to play a role in some human lymphomas. However, this has been unexplored in canine lymphoma. Given the striking similarities between human and canine lymphoma, the objective of this work is to characterize the function and role of EZH2 in canine lymphoma. The investigators will utilize an EZH2 inhibitor to study EZH2 in canine lymphoma cells. The information obtained from this study will help guide the future development of this targeted inhibitor for use as a novel therapy to treat canine lymphoma. 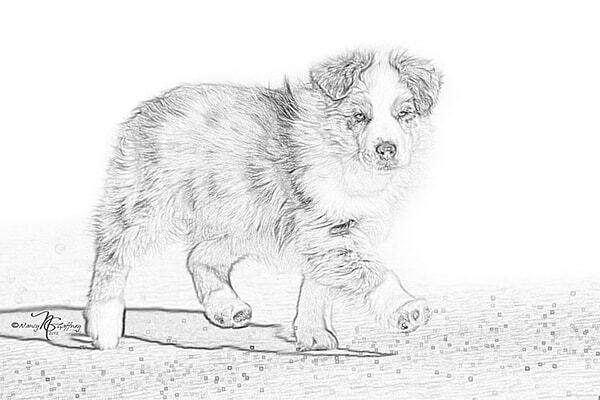 Thank you for supporting the United Shepherd Australian Shepherd Foundation, together we can make huge strides in the health of our great breed!